2 x 1.75 x 10" 2 x 10" 2.5 x 1.25 x 7.5" 3 x 4" 3.5 x 2 x 7.5" 3.75 x 6.25" 4 x 2 x 9" 4.75 x 6.75" 5 x 2.5 x 11" 6 x 3.25 x 13.5" 6.75 x 9" 7 x 15" 8 x 4 x 18" 9 x 12"
Buy More Biodegradable Cellophane Bags Save More! The NatureFlex™ 1.2 mil bulk cellophane bags are made from 100% clear compostable cellulose found in wood fibers taken exclusively from sustained forests. Their high Oxygen barrier properties are essential to your product's quality and shelf life, so fill them up with a loaf of bread, cookies, or other tasty treats. You can heat seal these bags or tie them up with a twist tie! See all our Green Way ® Eco-Friendly Packaging! Nature Flex™ cellophane bags are perfect favor and candy bags. These bags are available both flat and with gussets! Our 1.2 mil, biodegradable cellophane bags made from wood cellulose fibers sourced with sustainable forestry principles, certified biodegradable, compostable and made carbon zero. 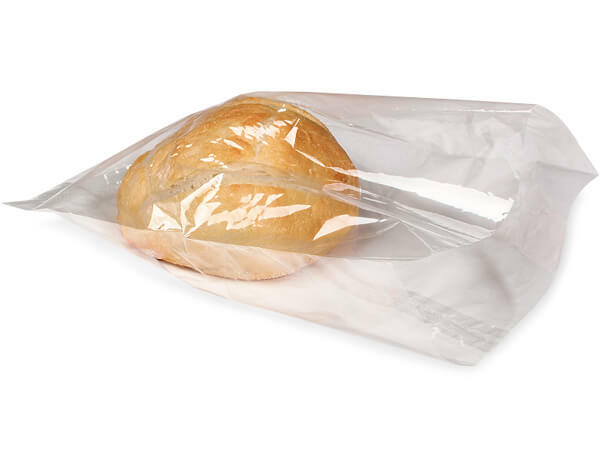 Each bag meets ASTM D6400, EN13432 standards for CA and other states, complies with FDA regulations for food packaging and is heat sealable with high oxygen barrier properties. We offer these bags at wholesale prices in bulk cartons of 1000 or small packs of 100.